I help customers with their breakdown cover. That means checking their needs and promoting new services that would suit them, such as Car Genie – our innovative device which warns Members of issues their vehicle may have, so they can prevent a breakdown. 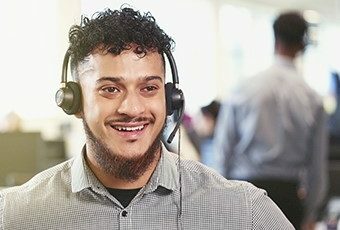 Car Genie is a perfect example of the commitment to great customer service which made the AA such an attractive employer to me in the first place. I’m proud to be part of such a reputable company. I get lots of motivation from satisfying customers. In my role, I have to be prepared to help them in any way possible. I make sure I’m well organised and prepared for any call. That means, when I come across a new situation, I can deal with it. It’s all about being Ready for anything. The AA has given me a platform to grow as an individual. I love the team that I work with, and the passion and drive they bring to the department. They really made me feel at home when I joined. We’re all willing to go the extra mile for each other. I find a strong team leads to better work. My manager is excellent and always supportive, providing me with tips for improvement. I see myself as a manager one day, being someone that people look to for help and guidance.